At the age of 19, I moved to New York to pursue a dream -to become an actor. As an immigrant child, living in the land of opportunity, this seemed a reachable goal. As it turns out, it happened. I don’t know whether it was determination and perseverance, or if it was pure luck. Either way, I have been fortunate in an industry that has no set formula for success. I’ve been exceptionally lucky to work across all mediums of my industry. I have been on Broadway, national and international theatres, film, and television. I’ve been a part of cultural phenomena and had the absolute pleasure of working along trail blazers of my field. But, like most people, one begins to ask “What’s next? What do I do now?”. About two years ago, I set on a journey to create my own content. My new dream was to start producing. Through this venture. I have begun to understand the true power of storytelling. The power of having a vision, a voice, and the power of sharing. The human condition is unique and vulnerable. It is also unexpected, and unpredictable. In my productions up to this point, there has always been an underlying theme of loneliness, a need to belong, to be a part of something greater than yourself. These are characteristics that have always drawn me to the stories that have shaped me as an artist because these are things I seek for myself. At the beginning of the year, I sat down with my friend Doug Roland, who I met in New York about ten years ago. Through an unexpected turn of serendipitous run ins in Los Angeles, we would check in on each other periodically to see what we were working on. In February, I read Doug’s script to “Feeling Through”. 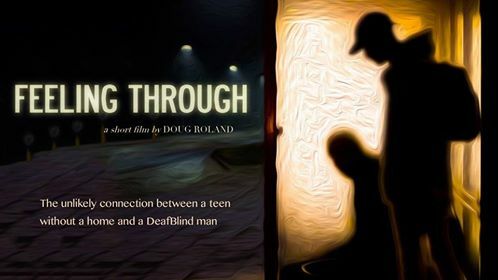 I instantly fell in love with the story about a New York City teen without a home and his unlikely and unexpected connection with a DeafBlind man. Tereek, the teen without a home, is vulnerable and searching for purpose. In a way, he is looking to belong -to be noticed. We began the journey of bringing this story to life, working on the budget, plan of action, and time lines. We had conversations with friends and anyone who would listen. Doug began visiting and reaching out to DeafBlind organizations. He was convinced that he wanted to include in the cast a DeafBlind actor. This decision lead our team to knock at the doors of the DeafBlind community. I must admit, I has never met anyone from this community. Doug only had one interaction, which took place 7 years ago and became the inspiration to the film. I kept thinking…how could an individual, who cannot see nor hear be able to “act”? How will we communicate? Could we make it work? In my ignorant and limited mind, all I could envision was the limitations, darkness and silence. In May, I went to The Braille Institute in Los Angeles with Doug and Django (one of the other producers) to the center’s DeafBlind day. We were welcomed with open arms and were given a tour of the facility and its different activities. Words cannot, and will not ever do justice to what I have learned, experienced, and felt in my interactions with this community. The Braille Institute teaches classes in braille, sign language, as well as tactile sign language. Tactile sign language is fascinating. As one individual uses American Sign Language to speak, the other individual places their hands over the deafblind person’s hands as a way of communicating to them. This goes on back and forth at an unfathomable speed. The center has classes on how to go about everyday life to teach independence within the DeafBlind community. Along with The Braille Center, Doug reached out and began having conversations with The Helen Keller National Center in Long Island, NY. HKNC is the world’s largest center which aids the DeafBlind community. People from all over the country and the world come to the HKNC to learn skills to live a full life. In August, I went on my first trip to the center’s vast and lush campus in Long Island. We (film crew and all) were there to shoot footage for our crowdfunding video, filming art and technology classes. There were courses to teach deaf individuals who are beginning to lose their vision at later stages in life how to use support canes and how to navigate through life as their vision fades away. We held interviews with members of the community about their thoughts on the project itself, specifically about our commitment to casting a DeafBlind actor as a lead in the film. This would be the first time that something like this happens and I would have a role in changing the course of history. Throughout this day, I kept excusing myself to the nearest restroom to get my emotions in order. I wasn’t expecting this kind of opportunity and responsibility. While in tears, I was moved, determined, and inspired. I was humbled, yet fueled to take on this challenge. I felt empowered by the community’s strength, sense of hope, and perseverance. Here are individuals who cannot see nor hear.